The Ryder Cup rose to the digital occasion setting audience records via their app, website and the PGA site. Turner Sports delivered an ace in the hole for partners at The PGA of America and the European Tour with record-setting video views of live golfing action at the 41st Ryder Cup hosted by the Hazeltine National Golf Club, and all-time social media impressions on the PGA Facebook fan page and Twitter handle to shatter previous tournament records. 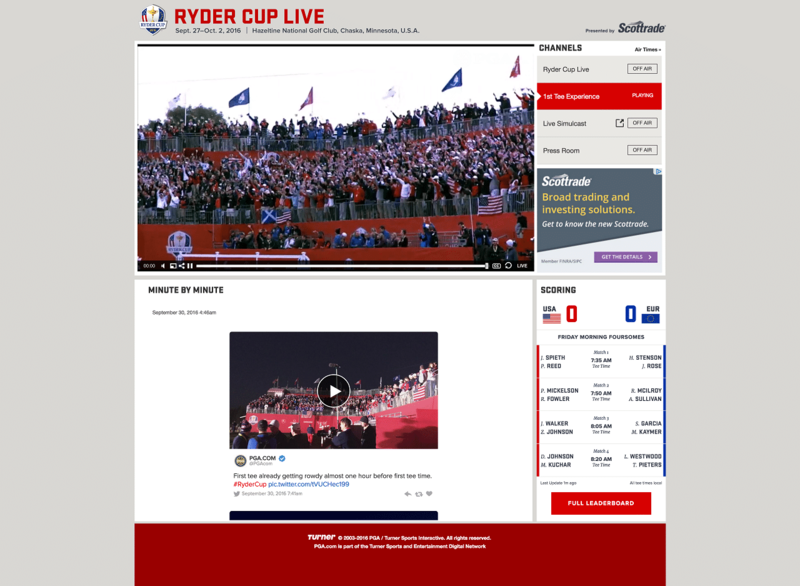 The Sports Techie community blog gives kudos to the Ryder Cup team at Turner Sports for optimizing the redesigned site and presenting a sport technology filled premier international team golf event for the digital ages. The new 1st Tee Experience show at Ryder Cup 2016 by The PGA of America teamed up with Turner Sports and NBC Sports. Measuring metrics is the name of the business game and for that reason alone, the post event breakdown of numbers produced stunning results, as was the victory by Team USA over a stunned but mostly gracious Team Europe. RyderCup.com and the Ryder Cup App over the three-day weekend event in Chaska, Minnesota, produced 3.3 million video views which is a telling indication of the value of live sports over the web. This resulted in the most-viewed online coverage of the Ryder Cup ever, an increase of almost 250% over the 2014 golf matches. 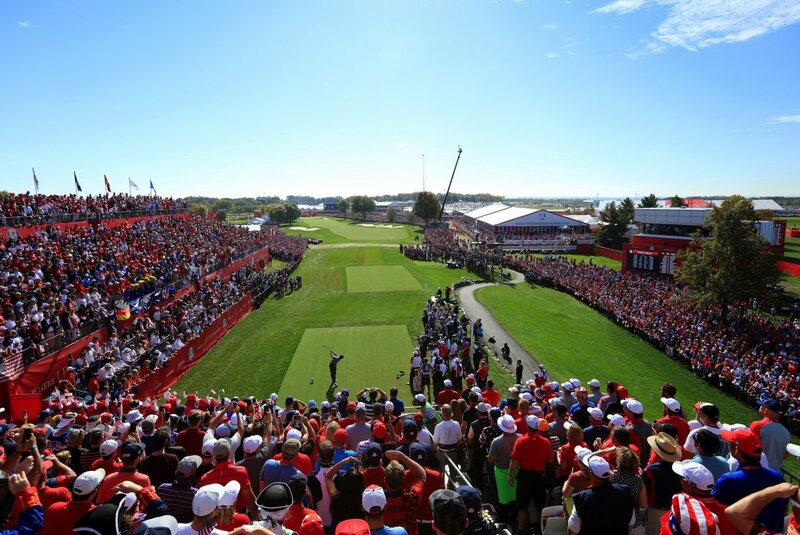 More than six million unique visitors hit RyderCup.com this year, a 27% jump versus 2014. Add in the record-setting 1.2 million live hours of viewing, an increase of 293% from 2014, and you can understand why this all-time international high has created a massive buzz between fans, sponsors and golfers alike. The first day of Ryder Cup coverage on Friday streaming over the app and website set single-day records because of 1.6 million live video views meaning 740,000 hours of fan consumption, equaling to 175% and 272% increases respectively, over opening day 2014. 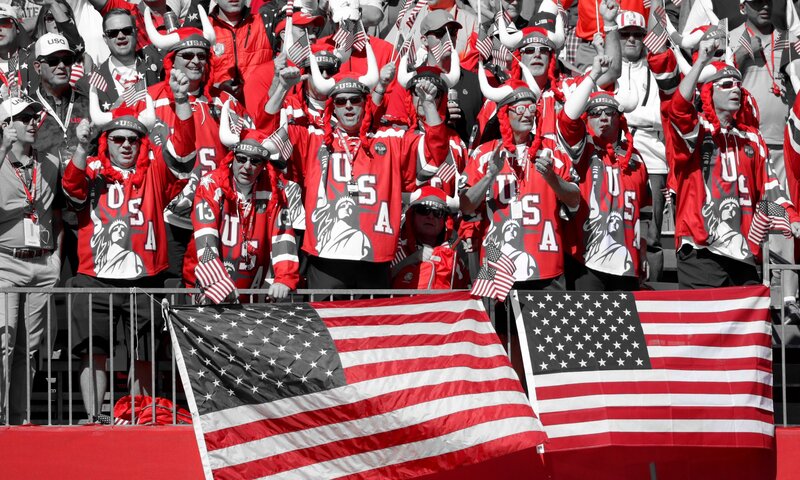 The fans set the tone on Saturday with a unscripted singing of our national anthem on the first tee. Brendan Porath of SB Nation captured this goose bumps highlight and shared it with a tweet for all to witness and enjoy if you were indeed rooting for Team USA. I love to use words to give life to sports tech inspired moments but in this case, I’ll let the Ryder Cup on YouTube video summarize the winning 2016 moment for Team USA when Ryan Moore sunk the putt at Hazeltine for the win. The Ryder Cup app debut of the new “Featured Match” live programming on Friday and Saturday was a hit with golf fans watching over the internet. Sunday included expert coverage and analysis of single match play. The Ryder Cup LIVE video player was available on smartphones, tablets, desktops, and TV apps as Turner Sports premiered “Featured Match” coverage and the new 1st Tee Show. The Ryder Cup LIVE commentating team hosted Facebook Live programming for 1st Tee. This multimedia platform featured the Wayfinding Spectator Resource, Minute-By-Minute Content Streaming, Facebook Live Programming and Virtual Reality Content. The new 1st Tee Experience show gave light to the amazing ambiance at the start of the first hole for fans not in attendance and complimented the experiences for those in attendance using Ryder Cup digital assets on the golf course as second screen companion when watching the riveting action in person. The PGA of America teamed up with Turner Sports and NBC Sports to display the first hand experience of the 1st Tee Amphitheater with a special digital-only show for RyderCup.com, GolfChannel.com, Facebook and Sky Sports mobile apps. The full grandstand was one of the places to be at Hazeltine because of the 1st Tee show that included fan chanting, celebrity guests, player exchanges, interviews and live action. Multi-camera pixellot technology was implemented for the first time to showcase to atmosphere via four unmanned camera angles stitched together to produce unique looks of the golfers performance, fan enthusiasm and poignant story lines. Experience Hazeltine like never before! A full suite of interactive Ryder Cup apps will be available across a wide array of platforms including phones, tablets and select Smart TVs. Both the Android app, sponsored by Samsung, and the iOS app, sponsored by OMEGA, will offer access to live video, breaking news, “Minute-By-Minute” aggregation of social content and live reporting, scoring, comprehensive coverage, photo galleries, a course tour, select live video casting for television, and on-site spectator resources. Golf fans attending the event will enjoy a completely immersive experience with access to a wide range of content and resources via the Ryder Cup app, including state-of-the-art course navigation. A first of its kind Wayfinding feature will deliver a detailed view of the course with routing instructions that account for walking paths and crosswalks to help enhance the spectator experience. The customizable map – built in collaboration with Google and Ubilabs – will also allow users to toggle their displays to show on-course points of interest, from merchandise locations to guest amenities. On-demand, fully immersive virtual reality content will be available for Ryder Cup via Facebook and YouTube VR apps on Samsung Gear VR or Google Cardboard. For users without equipment, the content will be available on YouTube.com, Facebook and RyderCup.com as web-based touch-and-pan 360-degree content. Turner Sports, in collaboration with Google and Ubilabs, developed the largest scale 360-degree photo experience ever for a sporting event. This unprecedented, interactive experience – under the Hazeltine Explorer banner – is available through RyderCup.com and the suite of Ryder Cup apps – allowing fans to virtually walk the course from a first person perspective. The tour also features custom elevation graphs for every hole, integrated video highlights and course-specific historical moments. The redesigned RyderCup.com is now fully responsive to better serve content across all platforms. Enhancements for the event’s official online destination include improved usability and performance, especially for mobile consumption, along with expanded video offerings, social integration and complete editorial coverage from a staff of PGA.com and European Tour writers. An enhanced leaderboard will include video highlights showing all the action from the day. Ryder Cup USA and Team Europe fans can experience all the excitement surrounding one of golf’s most engaging international events via a wide range of RyderCup.com and PGA.com social platforms including Facebook Live programming, special Ryder Cup-inspired emojis for Twitter, real-time Twitter highlights, and a Snapchat Live Story on Friday. Additionally, innovative 360 and virtual reality technology will capture photos and video that will live on Facebook, giving fans the immersive experience of being on the grounds with panoramic photos and video. Additionally, the app will feature live “Minute-by-Minute” multimedia streaming of social media content featuring video highlights, analysis and discussion. PGA.com is the official site of The PGA of America operated by Turner Sports, and RyderCup.com and the Ryder Cup apps are managed by Turner Sports on behalf of The PGA of America and Ryder Cup Europe. Ryder Cup App, Website Live Video And PGA Social Media Set Participation Records – Sports Techie blog. Sports Techie, if you did not watch this Ryder Cup, here are the highlights. Ryder Cup 2018 will be played on Continental Europe for the second time in tournament history at the Le Golf National in France. I personally cannot wait to see the innovative sports tech Turner will invent in the near future and showcase to the golfing world.